HORROR OR BLESSING? 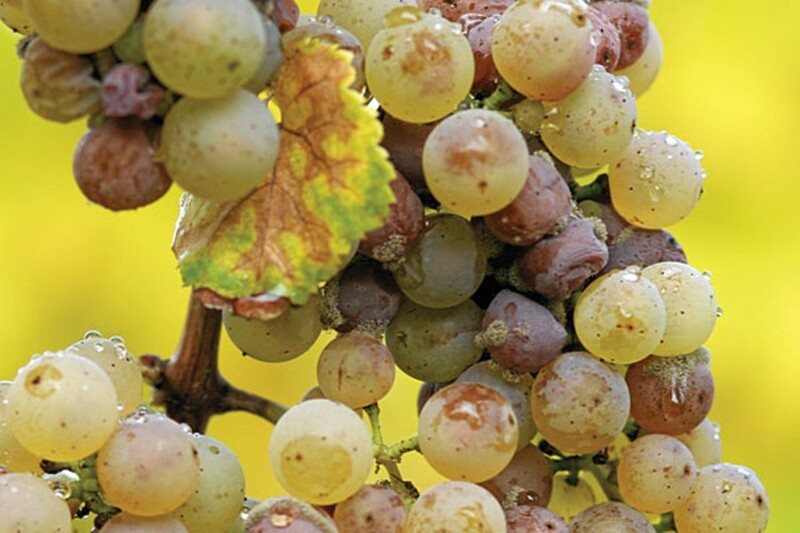 Botrytis, often reviled, has taken on a new cachet among certain winemakers. If an ugly duckling can grow into a beautiful swan, then perhaps it's no surprise that the most delicate, delicious dessert wines are made from rotten grapes. Botrytis cinerea is the dangerous mold that nearly all growers of grapes and other fruits worldwide fear as a destroyer of crops—and incomes. When carefully monitored, however, growths of the same fungus can do wonderful things to grapes—causing shriveling, intensification of the sugars and enhancement of flavor. For these reasons, winemakers call the mold "noble rot." The most famous "Botrytized" wines come from southern Bordeaux's Sauternes region, where Sémillon and Sauvignon Blanc grapes, harvested late in the fall with a dusty gray covering of fungus, are transformed into golden wines that taste deliciously of melons, pineapple and honey. Some, like the Sauternes from Chateau d'Yquem, are among the most prestigious wines in the world, commanding hundreds of dollars per bottle as newly released vintages. The area's unique warm-but-wet climate is said to be the perfect environment for Botrytis cinerea to thrive. But in California, a few inspired winemakers have emulated the old traditions of Sauternes. Mondavi, for one, has made a Botrytized white wine called, simply, Botrytis. At Longboard Vineyards, in Healdsburg, founder and winemaker Oded Shakked makes a sweet Sémillon bettered by the fungal fuzz of noble rot. And Dolce, a one-wine brand based in Oakville, also produces a Botrytized white sweet wine. Feared by winemakers, is the 'Brettanomyces' yeast good for brewers?